At NRGI, Aye works with the country manager in advancing the Myanmar strategy and overseeing its implementation. Her role includes the design, delivery and evaluation of research, collaboration with the civil society, technical assistance to the government and management of the country budget and grants. 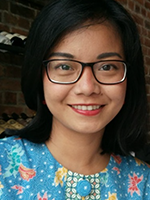 Prior to joining NRGI, Aye led the policy and economic research work of Yangon-based social enterprise Proximity Designs, conducted in partnership with the Ash Center’s Myanmar Program at Harvard’s Kennedy School. In that role, she managed research strategy and content. She also organized and facilitated dialogue among Myanmar’s key leaders on the topics of military reform, the peace process and sectarian conflict. She also recently held a consultancy with the Advisory Commission on the state of Rakhine, which was chaired by Kofi Annan. Before returning to Myanmar in 2014, Aye spent three years in Singapore with consulting firm Control Risks and business information provider Dow Jones, working on investigations, business intelligence, due diligence and stakeholder mapping. Aye holds a B.Sc. in economics from Singapore Management University.